Miss Dj Chrystal did her first steps in “Le Challenger” in St Jean De Luz. In 1996 she starts playing spanish Trance and captivates her first crowd, in “Metro” ’s afters (Irun, Spain). Few time later, she played in almost most famous Euskadi’s Discos, like “Ku”, “Keops”, and in many local bars. During 2003 she took a residency in “Le Tunnel” (Socoa, France), and involved herself in organising evening performances. Then, with a pure continuity of her sound, she worked parrallely on a different, charming, and more technical style, Tek-House. The followed residency in Itzela (Spain) and in several “Big-Bang” festivals (San sebastien, Spain) shows that the melting has worked. In a perfect and surprising way in both styles, her name, her percusive mixes have been quickly brought in front of stages. She made seductive performances in “La Fabrique” (Bordeaux) and in “Le Twins” (Paris). 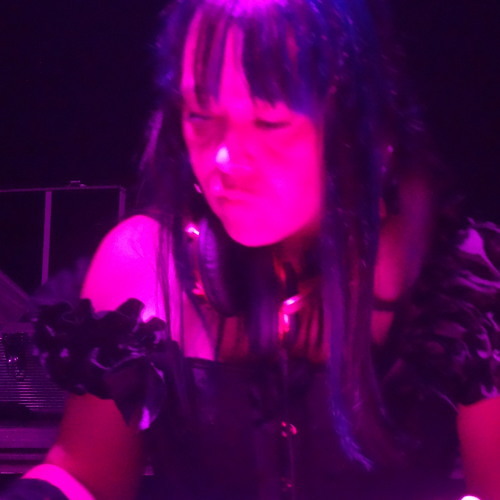 With a constant desire of new limits, she registers to several contests, like Amazon DJ Contest (Midnight Strategies, Paris) , and have been qualified for Fun DJ Tour (among 650 djs) where she faced the 25’s best french djs. Recently, she reached a contest’s final in “Es Paradis” (Ibiza), and made the musical atmosphere in a Haute Couture event in Biarritz’s Casino. Now, with respect to her senses, she experiments new sounds in her own produced mixes. She develops a home-studio project and works on new production’s songs with french composer Jonathan Léon .